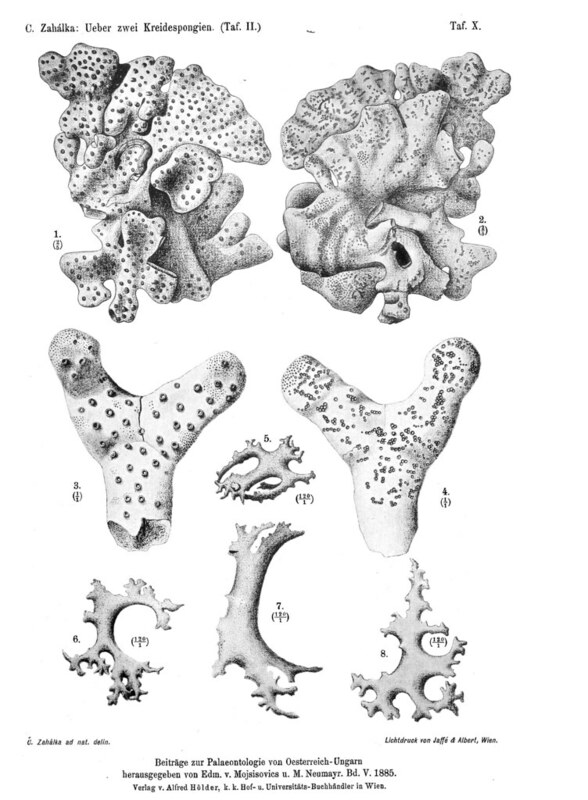 Marjorie O'Connell, 1919. 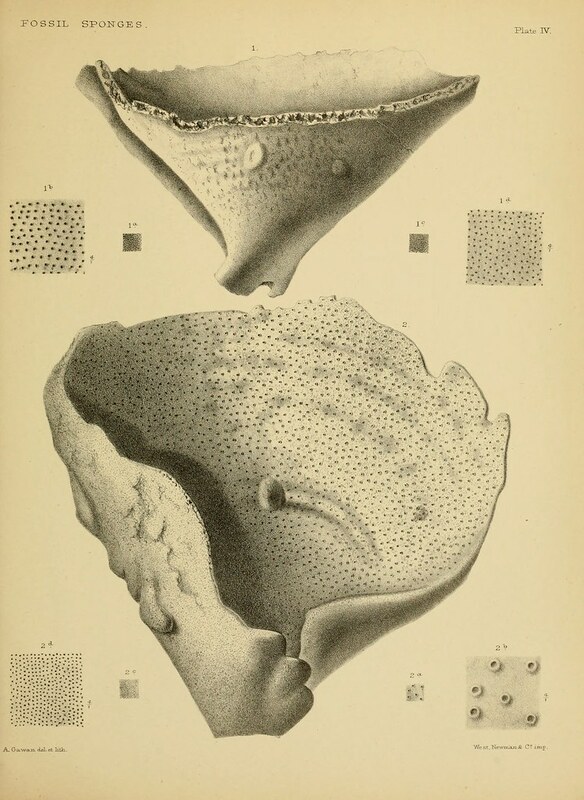 The Schrammen Collection of Cretaceous Silicispongiae in the American Museum of Natural History: with notes on the structure, classification, geological and geographical distribution, and synonymy of the Silicispongiae. 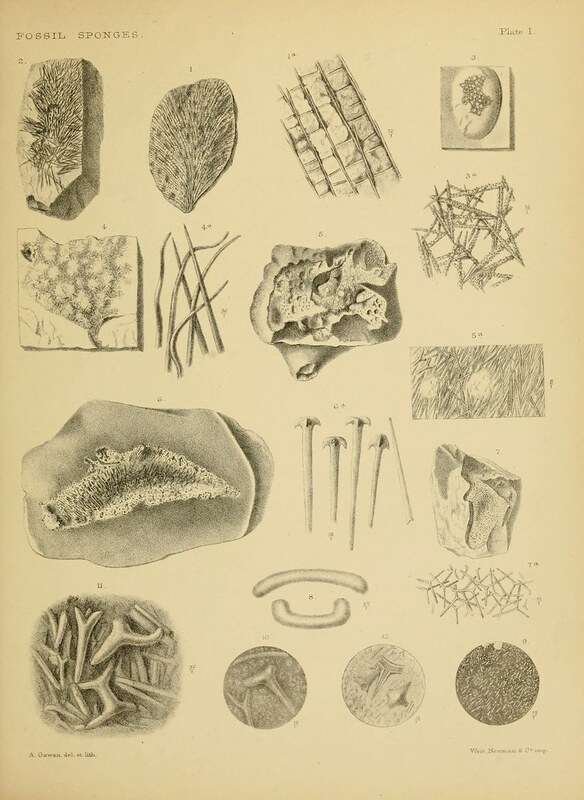 Bulletin of the American Museum of Natural History (AMNH) New York 41: 1–260. 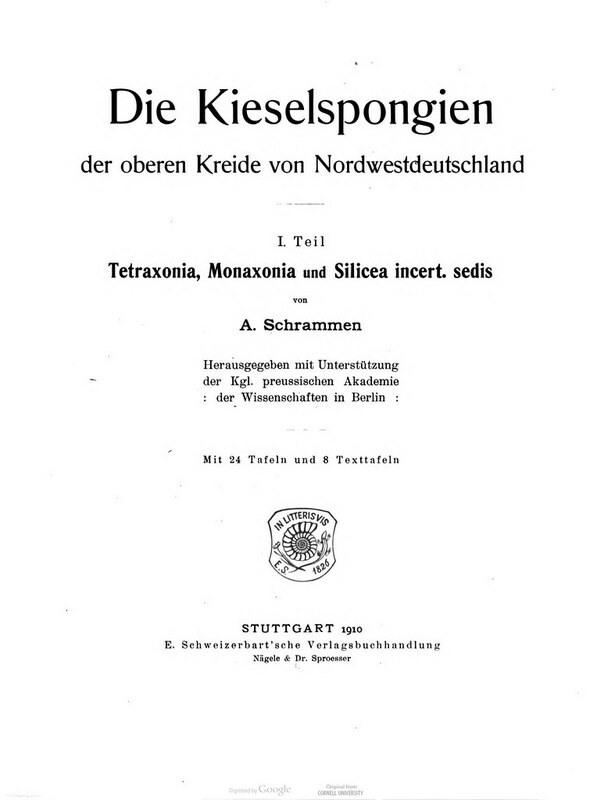 In 1840 August Emanuel von Reuss began his elaborate work which appeared under the title of 'Geognostische Skizzen aus Böhmen' (1840-1844), on the stratigraphy of the Bohemian Mittlegebirge in the neighborhood of Teplitz and Bilin. 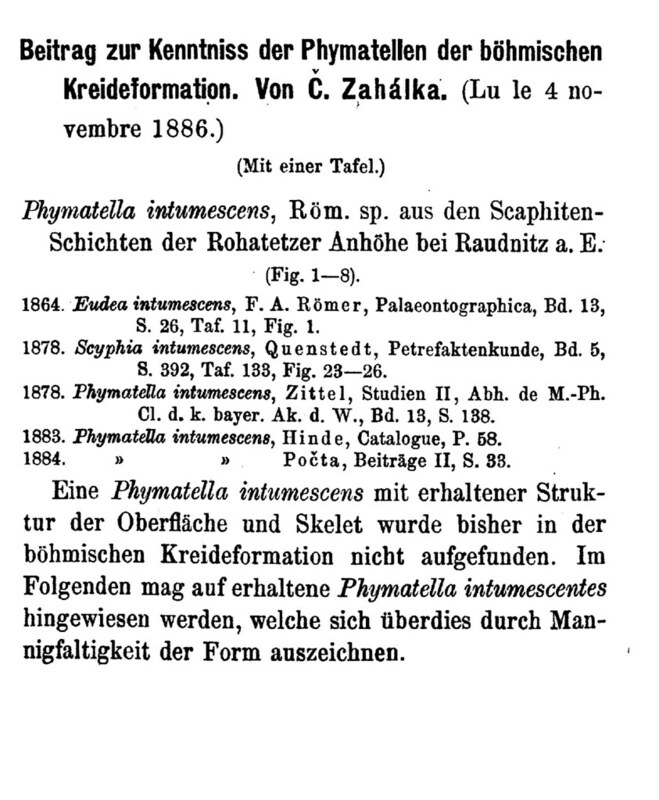 This was followed in 1845-1846 by a volume on the palheontology entitled 'Die Versteinerungen der böhmischen Kreideformation.' 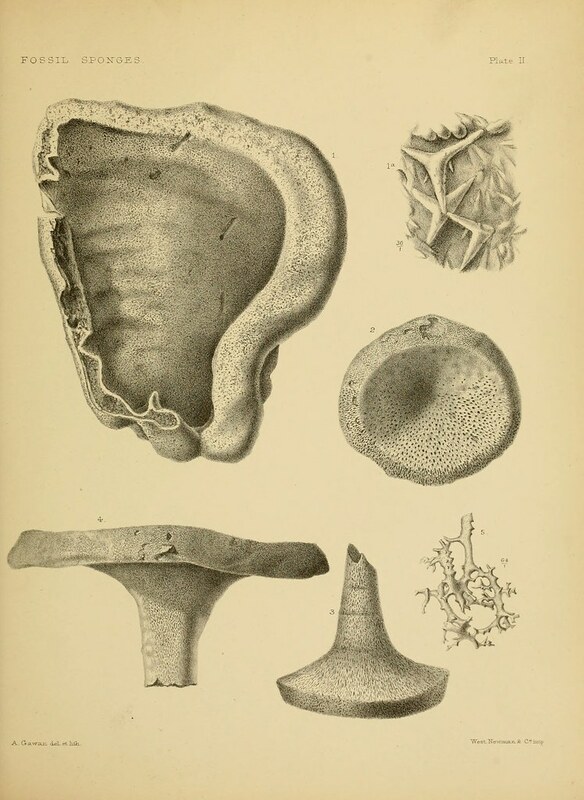 In this he described forty-three species of sponges but, like other Germans at that time, he followed Goldfuss in dwelling only upon external characteristics and his illustrations, though carefully drawn, show only the outer form of the sponges. 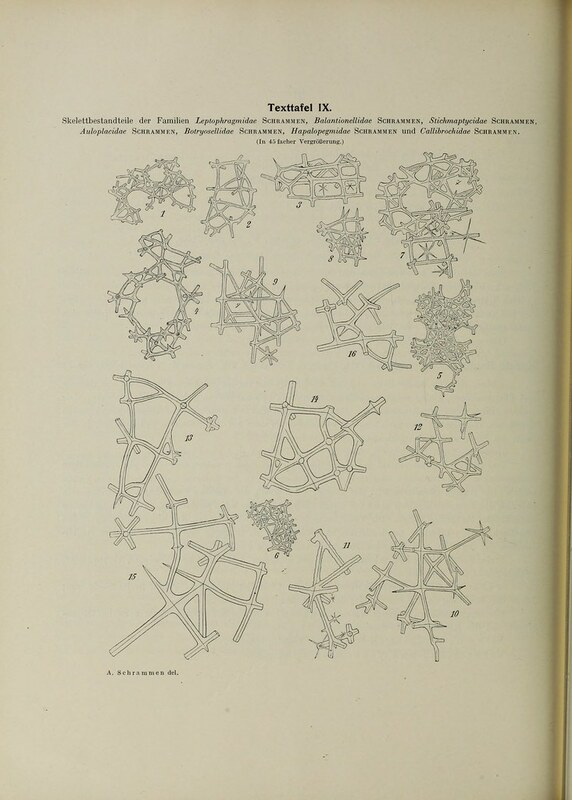 In 1869 the Natural History Survey of Bohemia was inaugurated and there appeared at Prague the first volume of the 'Archiv fiur die naturwissenschaftliche Landesdurchforschung von Böhmen' containing the exhaustive 'Studien im Gebiete der böhmischen Kreide-Formation.' 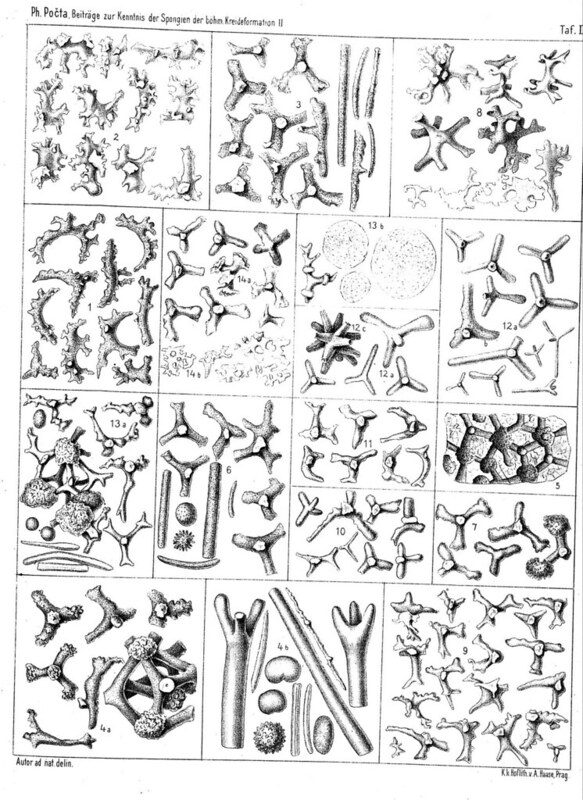 Johann Krejci (1869) wrote the general stratigraphic section, establishing the geologic succession and giving many detailed vertical and columnar sections, while Anton Fric' undertook the palaeontological investigations of the individual formations of the Cretaceous, and for forty years there have been appearing in the archives of the Bohemian survey monographs by the latter, these being completed in 1911 with a total of nearly a thousand pages. 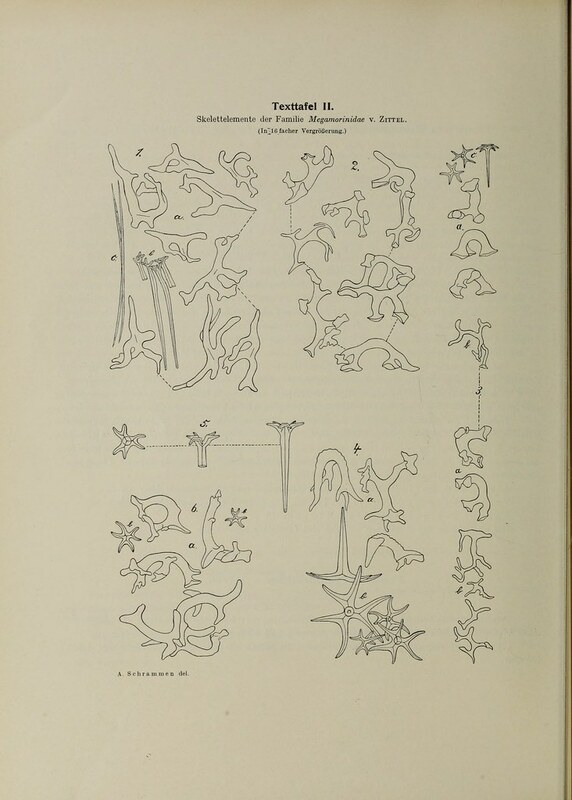 During this period he brought together, in connection with his studies, a marvellous collection of the Cretaceous fauna and flora of Bohemia, which is to be found in the Barrande Museum (Barrandeum) at Prague of which Fric was curator until his death two or three years ago. 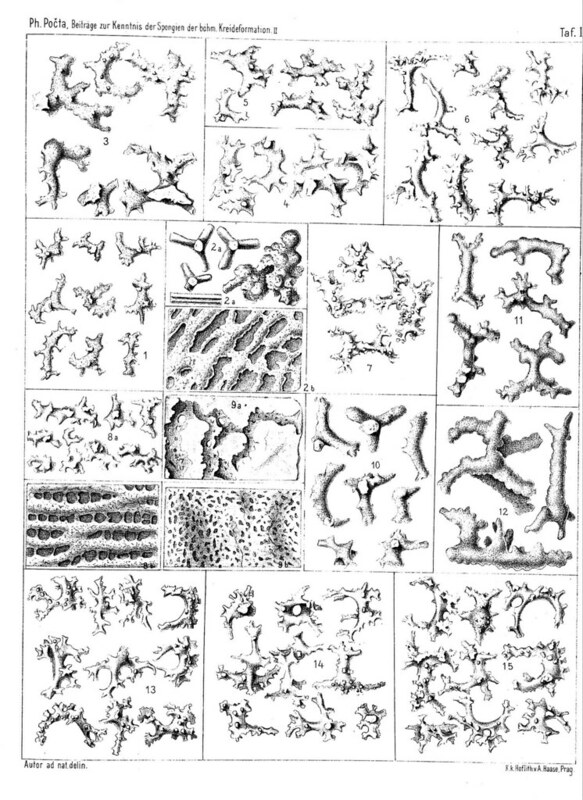 The stratigraphy and palaeontology have been treated with equal care and with a detail so great that it is highly improbable that future workers will need to make changes of more than minor significance. 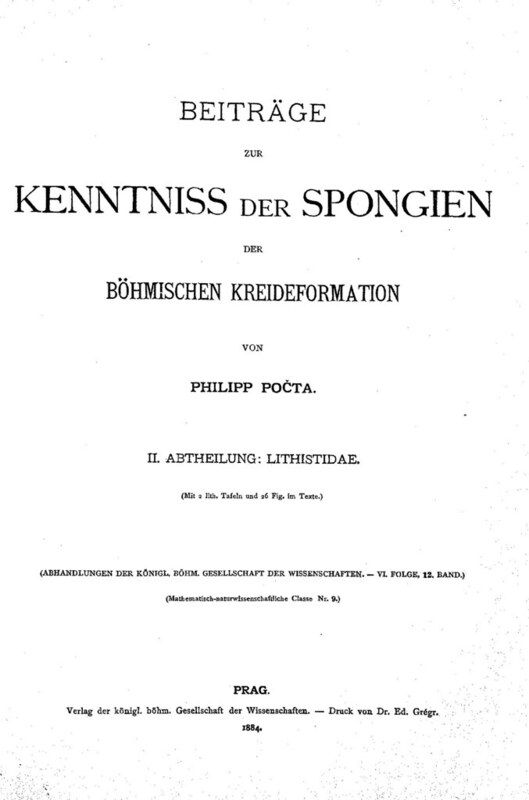 While the sponge fauna was found to have many species in common with that of northwest Germany, there was also revealed a large proportion of wholly provincial forms which, so far, seem not to have occurred elsewhere. 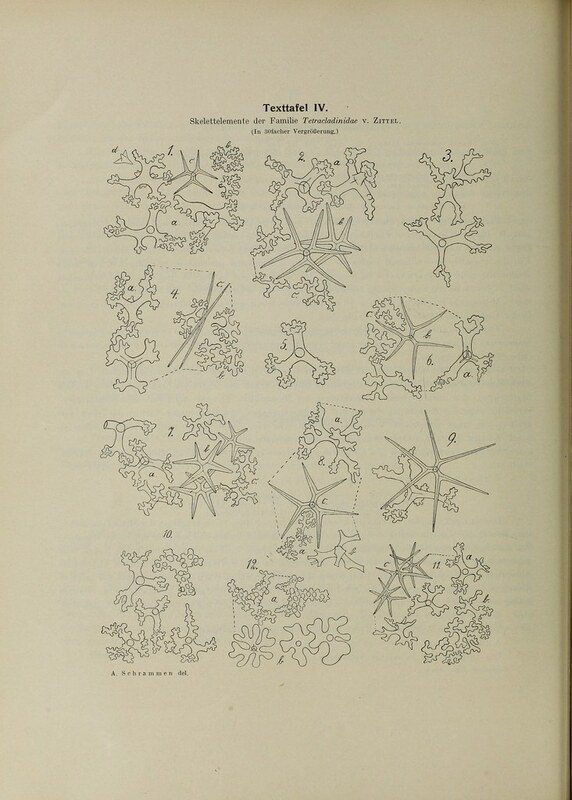 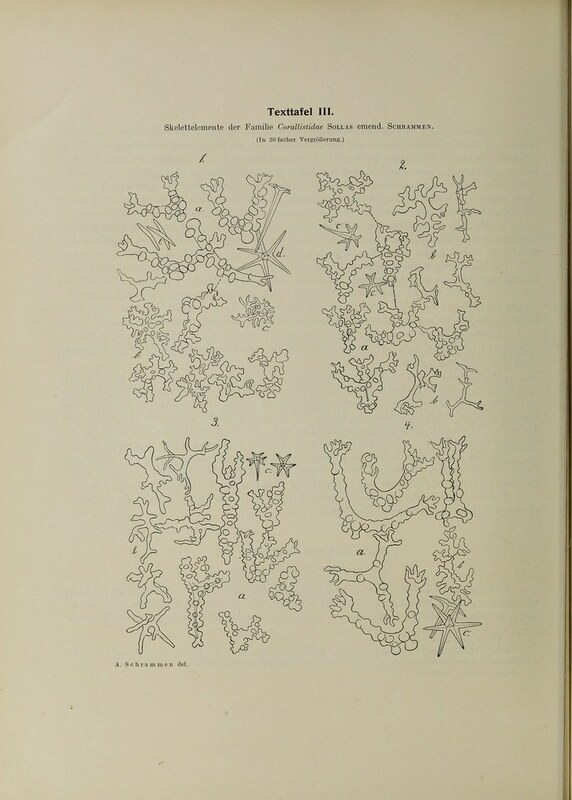 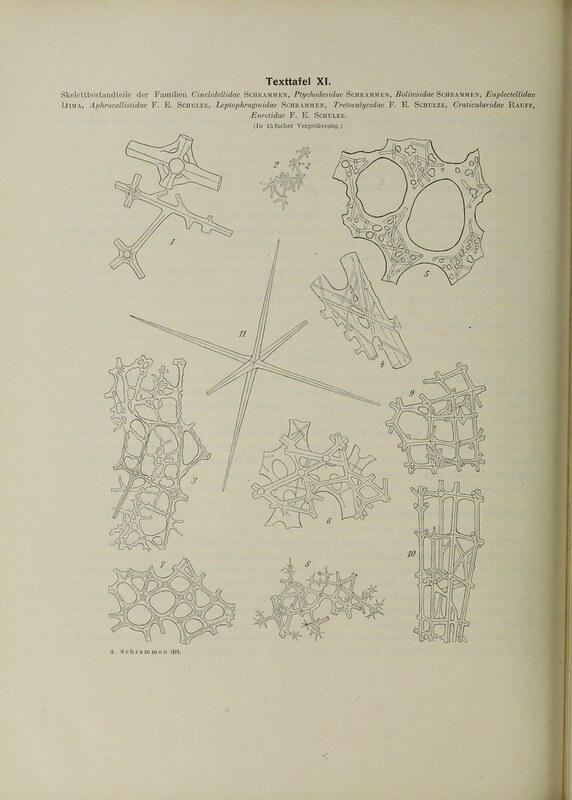 Fric did not essay the complete description of the entire sponge fauna but turned the monographing of it over to his pupil Philipp Pocta, in accordance with the general plan of the Natural History Survey to have complete faunal studies made for each phylum. 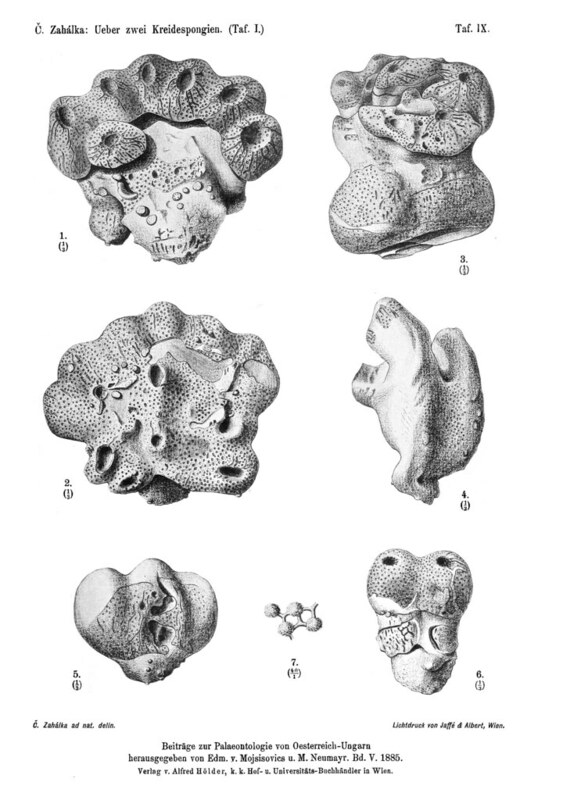 In Pocta's 'Beitrage zur Kenntniss der Spongien der böhmischen Kreideformation,' which appeared in three parts in 1883 and 1884, we find the one standard reference work for the Cretaceous sponges of Bohemia, corresponding to Hinde's 'Catalogue' in England and to Rauff's Paloeospongiologie' for the German Paleozoic and Schrammen's 'Kieselspongien' for the German Cretaceous. 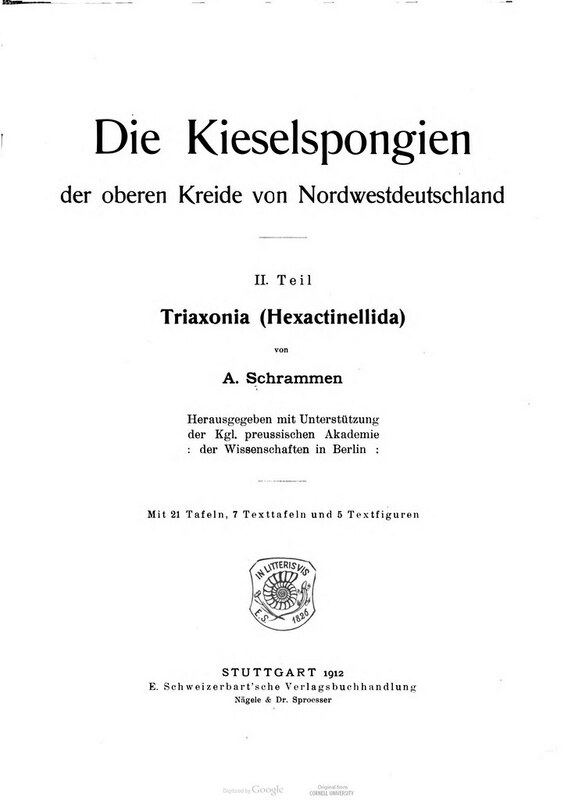 Zittel's classification and method are followed and the book will be found to be of especial value in containing the most complete synonymies for the species described that have appeared in any one treatise. 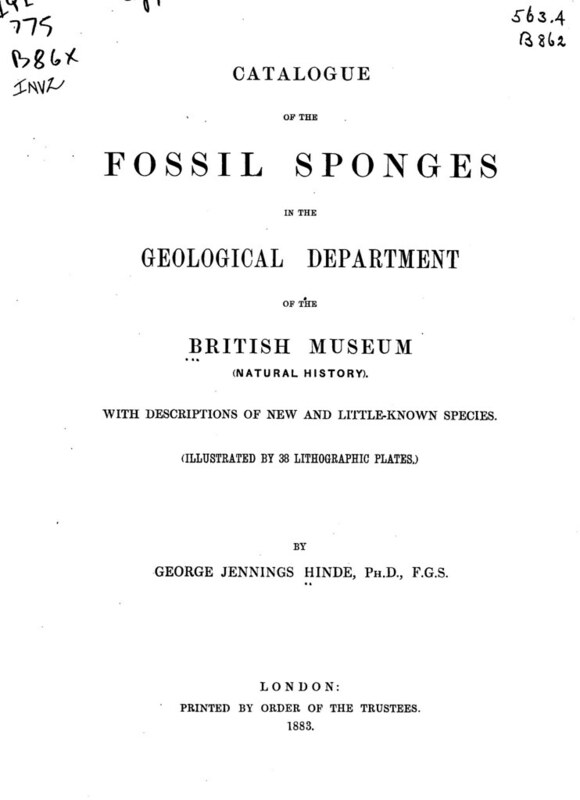 Additional species of sponges have been described from time to time in late years as new discoveries have been made, while already known species have been found in new localities. 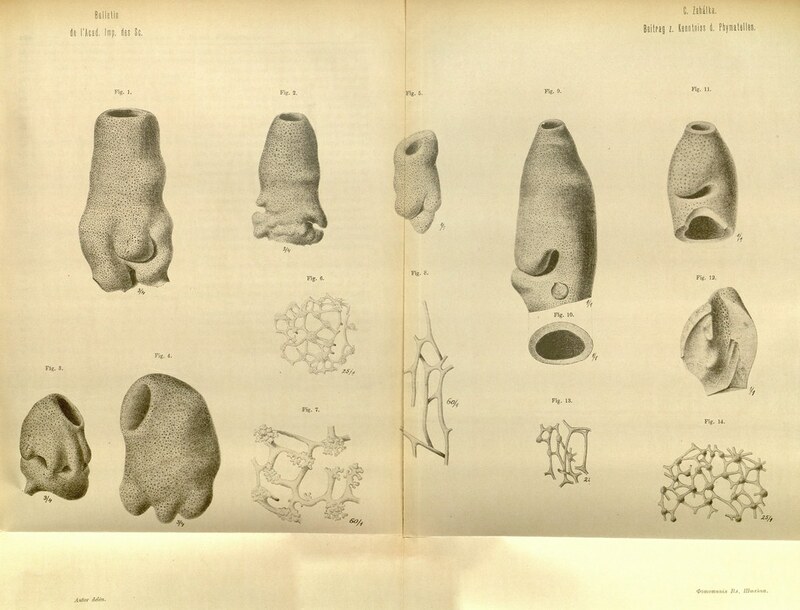 The more important recent writers are Cenek Zahalka (1885, 1886a, 1886b, 1887a, 1887b, 1888), Jaroslav Jahn (1891), Bfetislav Zahalka (1912a, 1912b, 1913), and Scupin (1907). 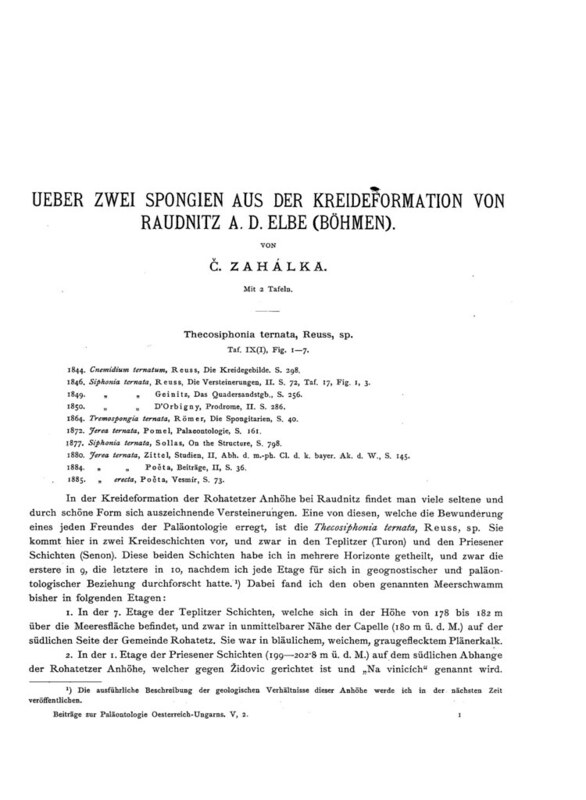 Cenek Zahalka wrote only short papers discussing previously named species or calling attention to new occurrences, his work being very local in character and confined mostly to the Cretaceous around Roudnice (German Raudnitz). 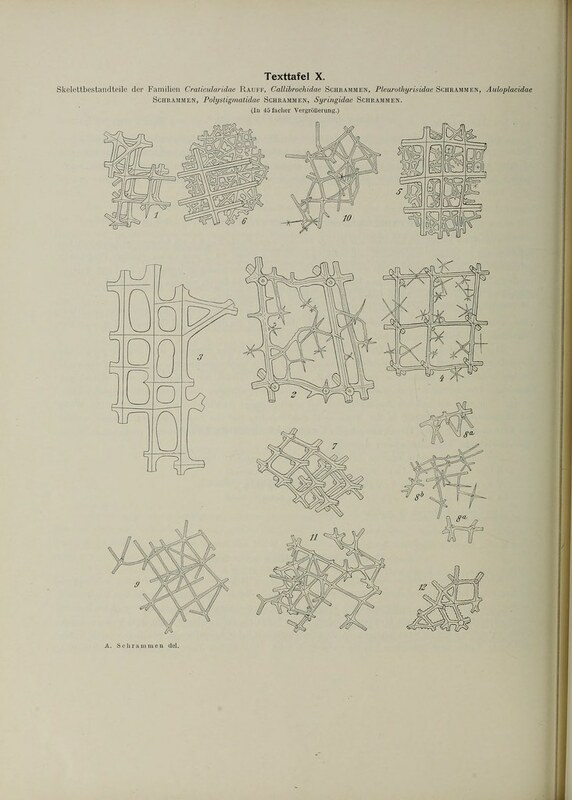 Many of his papers are short contributions, written in Bohemian and thus rather inaccessible. 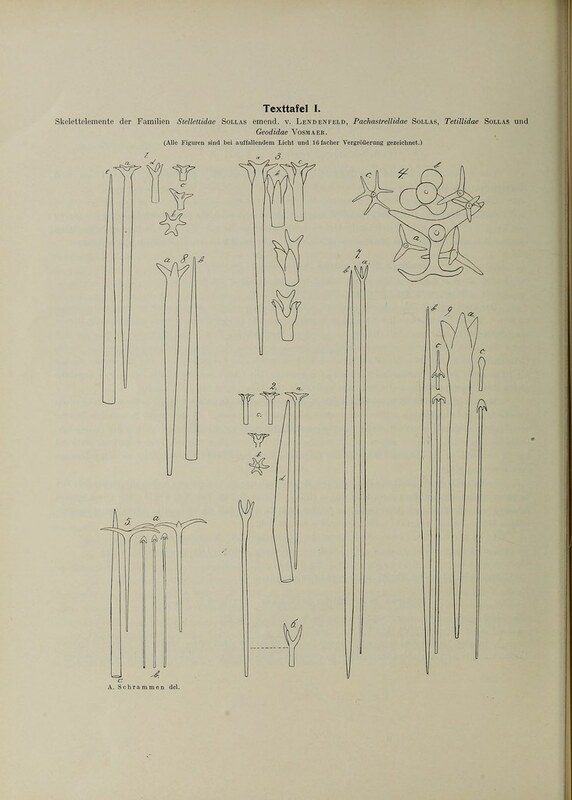 The stratigraphy of the Cretaceous around Prague has been worked out in the utmost detail by Bretislav Zahalka (1912a, 1912b, 1913, papers in Bohemian), who has not, however, paid much attention to the faunas, merely mentioning species in the text and listing them in summary tables. 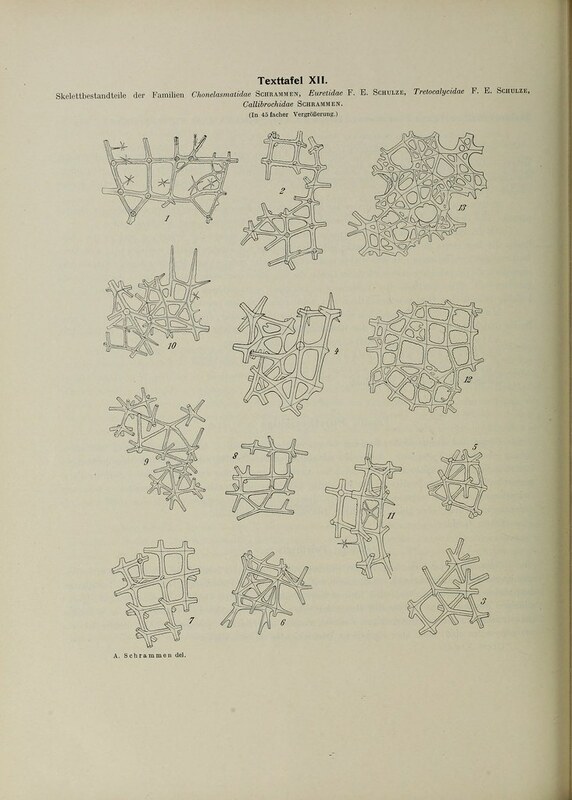 PDF: "O`Connell, 1919. 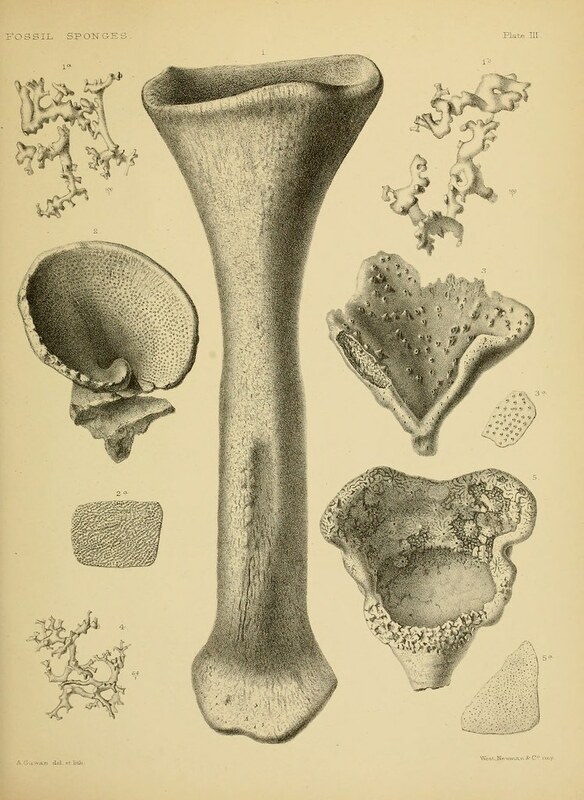 The Schrammen Collection of Cretaceous Silicispongiae in the American Museum of Natural History"